Abydos Temple is considered one of the most ancient Egyptian cities that is located about 11 kilometers west of the Nile. The sacred city of Abydos was the most important archeological sites in Egypt as it contained many ancient temples just like Umm el Qa’ab. Abydos is known today with the temple of Seti I. This amazing temple contains an inscription from the nineteenth dynasty known to the modern world as the Abydos King List. The city of Abydos was occupied with rulers from the predynastic period. Narmer was among the pharaohs from the first dynasty to be buried in Abydos in addition to other pharaohs of the second dynasty. After the construction of Pepi I from the 6th dynasty to the funerary chapel which evolved over the years into the Great Temple of Osiris, Abydos became the center of the worship of Isis and Osiris cult. It is known as the great temple of Abydos whose walls has what we can call “Abydos King List” that contains a list of the principal pharaohs of the Egyptian Dynasties. 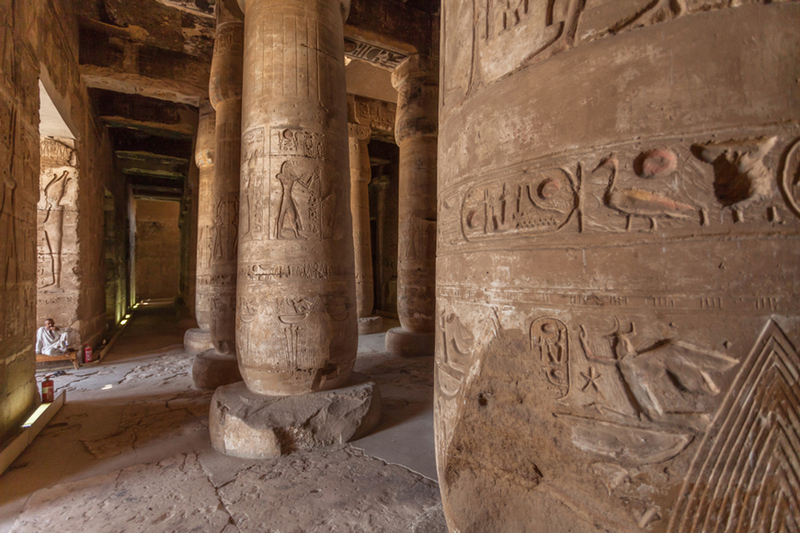 Inside this temple, there are about seven chapels for the worship of the deities & the pharaohs. There were also other chapels dedicated to the Abydos triad of Osiris, Isis, and Horus. There is also a construction at the back of the temple called the Osireion, which was the cenotaph for Seti-Osiris. The Temple of Seti I was originally 550 170 m long but the part that still in a good shape is about 76 m long and 110 m wide. Everything about this temple is not historical in its nature but religious that is a transformation of the king after his death. It was built using sandstone. The son of Seti I, Ramesses II, was the one who finished building the temple of his father. We knew that from the reliefs of the temple that depict Ramesses while slaying Asiatics and worshipping Osiris. What Can You See Inside the Temple? During the whole reign of the ancient Egyptian pharaohs, many temples, Chapels, and monuments have been built in Abydos including the huge chapel & pyramid of Ahmose I, the large temple of Thutmose III, the great temple of Seti I of the nineteenth dynasty to honor the ancestral pharaohs of the early dynasties and it was finished by Ramesses II. There are also a pylon, open courts, seven shrines of (Isis, Osiris, Amun-Ra, Ra-Horakhty, and Ptah), two hypostyle halls, and a chapel dedicated to Osiris. The last temples to be built there were the temple of Ahmose II and the new temple of Nectanebo I from the 30th dynasty. you can visit Abydos Temple and other landmarks in Egypt through our Egypt tour packages also you can visit it during a Nile cruise. in which you can enjoy Upper Egypt monuments along the Nile river.